Political thrillers can be a bore; long-winded affairs that can be equally long on sanctimony have a tendency to turn me off. For me, anything which is given this designation works best when the political aspects are sidelined as far as possible and the thriller elements are brought unashamedly to the fore. Even better is the film were the politics are of the entirely make-believe variety, serving only as a light frame upon which to drape a tale of intrigue. In 1938 Frank Launder and Sidney Gilliat turned out such a screenplay and in the process played a significant role in shaping the success of The Lady Vanishes, one of Alfred Hitchcock’s best British movies. 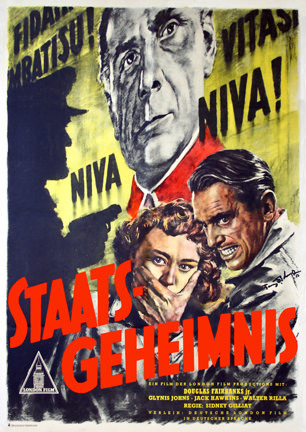 A dozen years later would see Gilliat both contributing to the script of and directing another British “political” thriller called State Secret (1950) – a neglected piece of hokum which remains highly entertaining. Middle Europe and non-existent countries (and in this particular case featuring what appears to be a specially created language that is used throughout the film) are the kind of ingredients which effortlessly draw me in. In this case it’s Vosnia, the undisputed realm of one General Niva (Walter Rilla). Frankly, I find it hugely refreshing that there is a deliberate vagueness about the leanings of this dictatorship; whether Niva is a leftist or rightist demagogue is never addressed, and the simple fact is it’s of no relevance whatsoever. When eminent surgeon John Marlowe (Douglas Fairbanks Jr) is persuaded to travel to Vosnia to demonstrate his pioneering new technique, it’s not important to know the color of intolerance and repression that holds sway within its borders – both the hero and the viewers are off on a pacy adventure, where the only thing that matters is the threat and not the philosophy supposedly driving it. So, Marlowe finds himself enjoying the kind of luxurious hospitality only the best totalitarian regimes can offer while he shows off his new procedure and collects what he’s been told is a prestigious award. Naturally, in a movie of this type, the whole scenario is merely a blind, an elaborate charade designed to conceal the fact Marlowe is actually operating on the seriously ill head of state. Perhaps a wiser man might have considered this possibility, and certainly would have made sure any suspicions he may have had were kept strictly to himself. But Marlowe isn’t such a man, and of course if he were, we wouldn’t have a film to enjoy. As it is, he makes a point of finding out who his patient is, and then finds that countries like Vosnia have a host of other feature to offer when patients whose identity it really would be better not to know don’t survive the procedure. What follows is a relentless pursuit across an alien landscape as Marlowe, with the initially reluctant assistance of showgirl Lisa (Glynis Johns), tries to elude the urbane but deadly Colonel Galcon (Jack Hawkins) and all the forces at his command. With location shooting in Italy, State Secret is an attractive looking British thriller, a fast-moving and exciting thriller which owes a debt to the writer/director’s previous collaboration with Hitchcock. The concept of the regular guy on the run, pursued across the country by shady types in the employ of a ruthless foe, is a familiar trope. And, in addition, there are scenes, such as the attempt to seek sanctuary in a theater and hide oneself among a crowd as the enemy closes in, all of which recall the likes of The 39 Steps and Saboteur, and also look ahead to North by Northwest and Torn Curtain. Gilliat’s script here is adapted from a novel by Roy Huggins (of The Fugitive fame), which I have yet to track down and read so I can’t say how much derives from that source. Fairbanks makes for a personable and sympathetic hero in State Secret, making me wish he’d done more of this kind of stuff. His was a rich and varied life and it seems sometimes that acting was only a small part of it all – he’ll probably remain best known, and probably deservedly so, for his roles as the amoral Rupert of Hentzau in the 1937 version of The Prisoner of Zenda and also as a soldier in Gunga Din two years later. Personally, I’d love to be able to see another of his movies, Green Hell, made available at some point as I remember it as being quite a lot of fun. Glynis Johns, daughter of Mervyn Johns, was in the middle of a productive run of work at this point and is an appealing and credible partner for Fairbanks. Jack Hawkins was one of the greats of British cinema; equally at home as either hero or villain, or any variation floating between, he lent class to any film he appeared in and here (bearing in mind the caliber of his co-stars) he consolidates an already distinguished cast. If I had a complaint to make, it would be that we don’t get to see more of Hawkins, and the same could be said for the always accomplished Herbert Lom. In the same year, Richard Brooks would make the similarly themed Crisis – with Cary Grant finding himself pressured into operating on a dictator and running the attendant risks – but that’s a slower, duller picture that tries harder to make a philosophical point but ends up losing its way as a piece of cinema. State Secret, on the other hand, is upfront about its aims as a piece of entertainment first and foremost and winds up being a better film as a result. Sadly, there don’t appear to be any strong versions of the movie available to buy. I have a Spanish DVD which is just about acceptable in terms of quality, but I couldn’t really endorse it. There’s also an Italian disc on the market and I suspect it’s probably from a comparable source. As such, all I can say is I hope the film gets a release somewhere that does it justice. Anyway, it’s a fine British thriller that is worth keeping one’s eyes open for – and perhaps it will come in for the treatment and attention it deserves. • First Time on DVD and Blu-ray! • Brand New HD Master – From a 4K Scan of the 35mm Safety Dupe Negative by Paramount Pictures Archive!